BAL – market leaders in full tiling solutions – have teamed up with international mosaic artist Natalie Guy for art and design charity fundraising project BowWow Haus London 2018. BowWow Haus London is a fundraising and creative collaboration between pet charity Blue Cross, American not-for-profit organisation Outdoor Arts Foundation and photographer Drew Gardener. 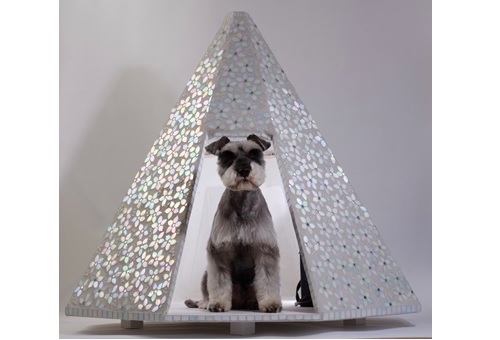 A network of architects, designers and artists – including Natalie – are creating bespoke dog kennels to be displayed throughout London for the first ever auction of artistic dog kennels in Britain. More than 75 one-off dog kennels will go on show at several London venues, including St Pancras International and will be available to buy at a charity gala auction on 26th April or via online bids. Inspirational names already on board include the internationally famous Zaha Hadid Architects, and multi-award winning designers Denizen Works. 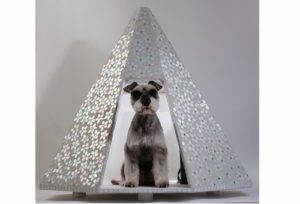 Natalie has designed a teepee shaped dog kennel featuring over 540 mosaic white flowers and buds, inspired by spring. The kennel has been grouted in BAL Micromax2 Gunmetal, kindly donated by the Stoke-on-Trent-based manufacturer. Alex Underwood, Head of Marketing at BAL, said: “We’re delighted to be able to support Natalie in this fantastic project supporting Blue Cross which helps sick, injured, abandoned and homeless pets each year.